The clients, a creative couple, wanted a space which was formal, with a lived-in feel. They had visualized a space which was earthy and close to nature in as many ways possible. The energy of the space was to be directed towards an ‘old meets new’ design. A contemporary cloth with an eclectic weave going through its every thread, this space eventually shaping up ‘as a home close to paradise’. The goal was to arrive at a harmonious fusion of ethnic furnishings with Spanish influences making it universally ‘design-sound’. The house had to exude the passion for creativity in art, applications, wall treatments and artifacts. 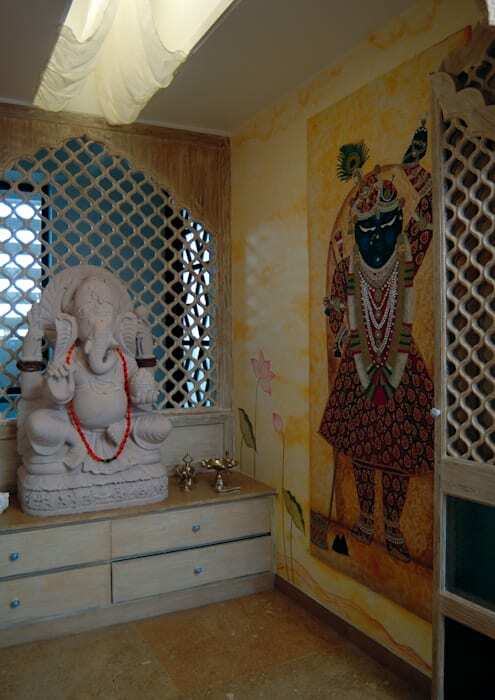 The client being an artist, self-expression as an art form was extremely important to get inspired within her own home. The house needed to walk on a tight rope to be able to balance a formal space along with being close to nature and having a ‘lived in’ feel.